Charles Patrick Nolan, a decorated World War II U.S. Marine Corps combat veteran, wanted to go home one last time before he died. It was 1997 when he had suffered a heart attack. He had called his son, Chuck Nolan, bailiff of the Garrett County District Court and resident of Deer Park, and told him that he wanted to visit Trinidad, Colorado, his birth place, the place where he had grown up; and he wanted to know if Chuck would take him. Located in the southeastern part of the state on Interstate 25, astride the old Santa Fe Trail which separates the Colorado Rockies from the Great Plains, Trinidad is just across the New Mexico state border with easy access to Albuquerque, New Mexico, the city where the senior Nolan had made his home during the years he raised his family and lived out his life. Chuck Nolan had flown out to Albuquerque on the first available flight, and it was on that trip that he made the commitment to honor one of his father’s most important wishes. Charles Nolan was a 17-year-old boy in 1941 when he quit high school and lied about his age in order to enlist in the Marine Corps. He was scared to death he was going to miss the “big war,” Chuck said. After being accepted into the Corps, Charles Nolan completed boot camp in San Diego, and was shipped to the Pacific Theater of Operations to join the 1st Marine Division, where he fought the Japanese under the command of General Douglas MacArthur, receiving two purple hearts for valor during his wartime field experience. “My father was a Marine’s Marine," Chuck said, "and I knew from day one that I, too, was going to be a Marine.” Guided by this desire, Chuck joined the Marine Corps right after graduating from an Albuquerque high school in 1969, and spent the first two years of his military service in Asia and Vietnam. He returned to the states, and was stationed at the Marine Corps barracks at 8th and I Streets SE, Washington, D.C., the home of the commandant of the Marine Corps, where he served for a short period as part of a team of body bearers that conducted burial ceremonies for veterans and their families at Arlington National Cemetery. Nolan left his service as a body bearer when he was assigned to the White House staff during the Nixon administration. Later, he was appointed to the security detail at Camp David. It was during this detail at Camp David that a friend introduced him to Jane Garrett of Garrett County, who would become his future wife. After Vietnam, Chuck, like other veterans, had to deal with the memories of war. He remembers taking a road trip with his father, and asking him how he had dealt with the war’s painful memories. When the fight for freedom ended, Charles Nolan had returned to the states and eventually moved to Albuquerque, where he became a traveling salesman and raised his family. He was big on family loyalty, Chuck said. When his father died in 2005, it was this same family loyalty that pushed Chuck to fulfill the commitment he had made to his dad on the trip to Trinidad. So on Dec. 12, 2005, the family had Charles Nolan's body was cremated, and Sean Nolan, Chuck’s older brother, kept the ashes in Texas, while Chuck began the long and slow process of getting his father buried in Arlington Cemetery. It wasn't easy, according to Chuck. It took him a year to get his father's records from the VA. When his efforts were bogged down, he turned to Brad Stewart, owner of Stewart Funeral Home in Oakland. "Brad offered to help me; he said he would try to speed things up, so I turned over all my father's records, all the paper work to him," Chuck said. Stewart's help was invaluable, according to Chuck, and the process began to move forward. "We (the Nolan family) had the feeling, we knew that when it happened, it would come down quickly," Chuck said. And their feelings were right. On Jan. 9, Arlington Cemetery confirmed the burial date — it was set for the 24th — giving everyone two weeks to make their arrangements and get to the funeral. Veterans buried at Arlington Cemetery are afforded military honors at the request of the family, and the Nolan family wanted Charles to be buried with military honors. Standard military honors are available to any enlisted service member or officer. According to military protocol, standard honors consist of a six-man body bearer detail, a firing party to fire a three-rifle volley (often confused as a 21-gun salute), and a bugler to play taps, as well as a chaplain. The body bearers carry the flag-draped casket to the grave and hold the flag over the casket while the chaplain speaks. Following the committal service the firing party is called to attention and fires a three-rifle volley. 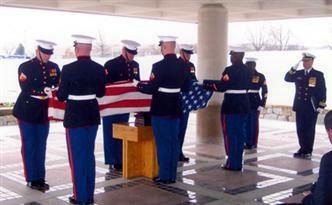 Then a bugler plays taps, and the body bearers fold the flag, which is then presented to the next of kin. Charles Nolan was laid to rest on Wednesday, January 24, 2007, with 19 members of his family present from all over the United States, including his wife Mabel and his surviving children, Chuck, Sean, Jackie, Maggie, and Kate, and their children. Coincidentally, when the rifles were firing the three- round volley, 21 canons were firing in the background, an event that is reserved for the burial of presidents and dignitaries. Supposedly, the two events were unrelated. But the unusual did not stop there. One of the body bearers broke rank after the flag had been given to the Mabel Nolan, and presented himself before Chuck, and while standing at attention, saluted the former Marine, who had also served as a body bearer. Somehow, the Marine detail had been tipped off. Because Chuck had persevered in his efforts to have his father buried with military honors in Arlington National Cemetery, his children, and grandchildren, and great-grandchildren can say that they have a relative buried with presidents, dignitaries, and soldiers — the heroes who died for our freedoms — in Arlington, Va., on hallowed ground. This is what makes Chuck Nolan happy when he thinks of his father now.